Tom Petty & the Heartbreakers, "The Last DJ," Warner Bros. 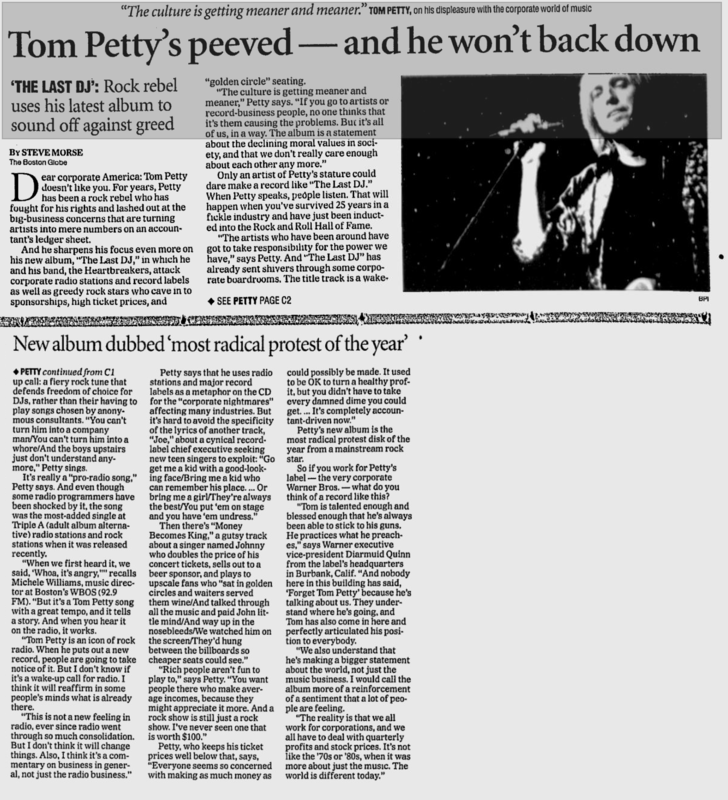 Petty has always seemed to have more in common with Joe Rock Fan than the larger-than-life stars with whom he shares Rock and Roll Hall of Fame membership. It's no surprise, then, that the anger, frustration and sadness over the state-of-the-rock-union in this loosely thematic album reflect the view of the disheartened classic-rock fan more than that of the jaundiced rock star. The album works on a number of levels, but the ambition behind the songs and the off-the-cuff production don't slap you in the face. Petty brings a disarming, regular-guy passion to his treatise, invoking many of his '60s and '70s rock heroes along the way. Dear corporate America: Tom Petty doesn't like you. 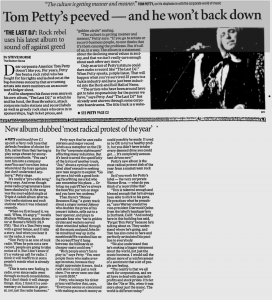 For years, Petty has been a rock revel who has fought for his rights and lashed out at te big-business concerns that are turning artists into mere numbers on an accountant's ledger sheet. And he sharpens his focus even more on his new album, "The Last DJ," in which he and his band, the Heartbreakers, attack corporate radio stations and record labels as well as greedy rock stars who cave in to sponsorships, high ticket prices, and "golden circle" seating. What's that draped across Tom Petty's shoulders -- Superman's cape? It'll take super-human power to permeate the gray matter of members of the music industry, but that's what Petty and the Heartbreakers want to do with the new CD, "The Last DJ." Petty wrote every song, and no one escapes his X-ray vision -- not the money-grubbing record company executives (the focus of the cynical song "Joe"), the power-hungry radio station owners (the reason for the title track), the stars who allow their talent to be superseded by marketing strategies, nor the folks who sit in the most expensive concert seats. Conventional wisdom says that everybody loves an angry young man and nobody likes an angry old one. Well, on behalf of angry old men everywhere, conventional wisdom can go take a flying leap. Better still, it can go take a listen to Tom Petty's superbly vitriolic new album and realize the error of its ways. The Last DJ, the 14th album of Petty's 26-year recording career, captures the shaggy heartland rocker at his most curmudgeonly, frustrated and disillusioned -- and at his most vital and outspoken. More or less one long and bitter harangue against the arrogance, ignorance and greed of the music industry, many of The Last DJ's dozen egdy, guitar-driven tracks lash out at corporate-sponsored rock tours (Money Becomes King), homogenized radio conglomerates (The Last DJ) and the heartless, manipulative record moguls (Joe) that "want to see how much you'll pay for what you used to get for free." Granted, on the one hand, there's a certain irony in hearing Petty -- a guy who's been a major-label act longer than Britney's been alive -- biting the hand that feeds him with lyrics like, "Bring me a girl, they're always the best / You put 'em onstage and you have 'em undress." But the truth is, Petty's been raging against the star-maker machinery for almost as long as he's been part of it -- oldsters will remember he threatened to change the title of 1981's Hard Promises to $8.98 to sabotage a proposed price increase by his label. Since then, he's continued to walk that walk, bitching about videos, eschewing corporate sponsors and refusing to sell his music for ads. NEW YORK -- Cue the first few cuts on the new Tom Petty & the Heartbreakers album and you may wonder why they're still making music in the first place. The songs -- from the perspective of a musician whose career started "when money wasn't king" -- scald the music business from several different directions. There are disc jockeys with hands tied by corporate owners, cynical executives getting rich off disposable pop starts, and a singer performing for wine-sipping poseurs while his real fans look on, disheartened, from the cheap seats. Is this a career suicide note from an act only seven months removed from induction into the Rock and Roll Hall of Fame? Tom Petty won't back down. But occasionally, he may issue a clarification. That's what he has done for WAXQ (104.3 FM), the classic-rock station, after it expressed concern about the title track from his new CD, "The Last DJ." "It's a great record," says WAXQ program director Bob Buchmann. "But even though we give our jocks plenty of room to play requests and speak, we were a little nervous listeners might think this song was aimed at us." Who more fitting than Jim Ladd, one of the last free-form radio DJ’s, to introduce Tom Petty and the Heartbreakers for their Tuesday night show, as the band played its new album, "The Last DJ," in its entirety at the Grand Olympic Auditorium? It’s not even too far a jump to conjecture that the album’s title track is about Ladd, who "plays what he wants to play." Tuesday’s show was broadcast live to radio stations and movie theaters around the nation, and the band put on an entertaining show for an hour and 45 minutes for those in the building and across the country. Playing the album’s tracks in the order they appear on the LP, the band was accompanied by an orchestra conducted by Jon Brion, who arranged the strings on the album. Songs like "Money Becomes King" benefited from this collaboration, as Petty sneered about the terrible music industry over flowing violins and clanging guitars. Tom Petty and the Heartbreakers | "The Last DJ" | Warner Bros. There's a famous scene in the 1976 film classic "Network" in which the late Peter Finch has had enough and sounds "I'm mad as hell and I'm not going to take it anymore!" "Network" satirized a struggling TV network that would air anything to get ratings. 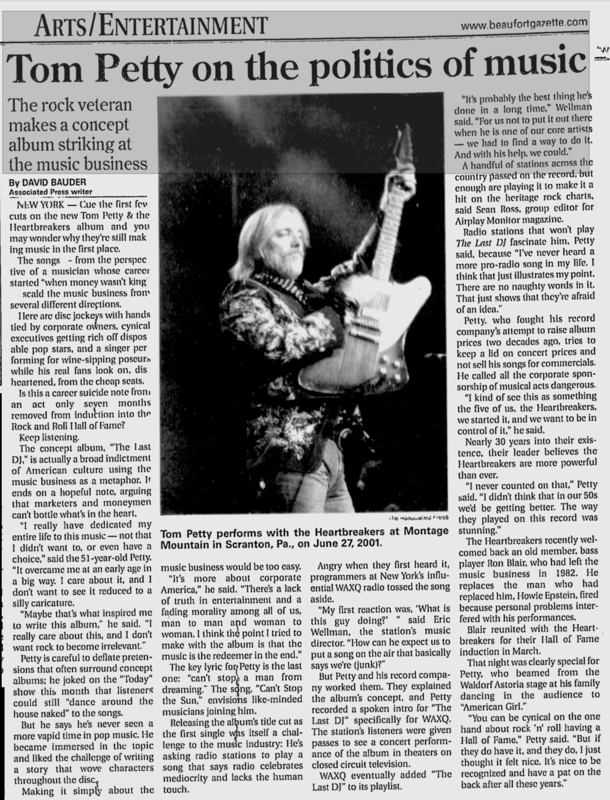 With the music industry subbing for television, Tom Petty is Peter Finch on his group's bitterly fed-up and tense new CD, "The Last DJ." On the title track, Petty mourns the sorry state of soulless corporate radio in which the individual voice is lost. "There goes the last DJ / Who plays what he wants to play / And says what he wants to say / There goes your freedom of choice / There goes the last human voice." "Money Becomes King" traces a once-idealistic rocker corrupted by the system. "Johnny rock that Golden Circle/And all those VIPs/And that music that had freed us/Became a tired routine."